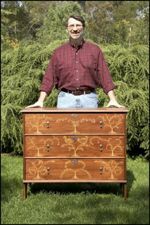 Norm tries his skills at replicating the Taunton Chest, so named after Robert Crosman. Crosman lived from 1710-1799 in Massachusetts. Condition of this NYW plan: This is a woodworking plan we purchased in a wholesale lot. Excellent condition, new in package. Plan is printed on two sheets of 18 x 24-1/2 inch recycled paper. Standard measurements only (inches). Sorry, the designer does not produce a downloadable version of this plan.